The lit à la polonaise had four columns and a canopy. Sometimes the canopy was decorated with a little graceful carving. A "pomme," or a bunch of feathers, ornamented the centre and each corner of the canopy. Hou-don, the sculptor, had a lit a la polonaise draped in yellow Indian damask trimmed with braid, the woodwork of which was carved and painted white. One of these beds, with a carved and gilt frame hung with crimson damask, was sold for 3,000 livres in 1770; another, for 2,500 livres in 1777; and a third for 1,100 livres in 1782. 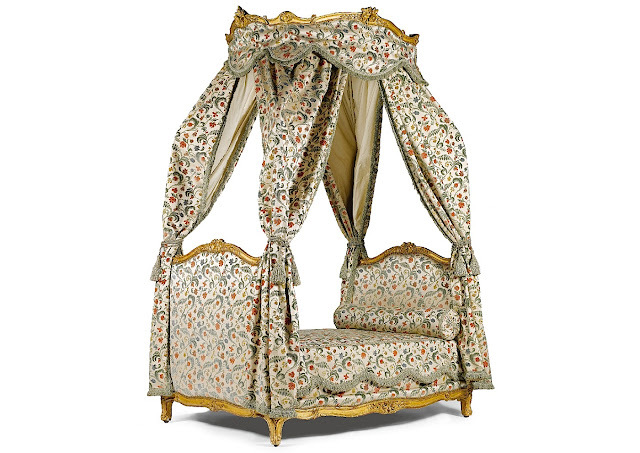 Sometimes the frames were made entirely of iron and draped.